Well it is July 4, and we are banned from fireworks due to very hot and very dry weather. But it's the Forth of July; something needs to explode! So with our Pop Rocks experiment (Pop Rocks Science) still fresh in mind, I decided to make some exploding cookie bars! 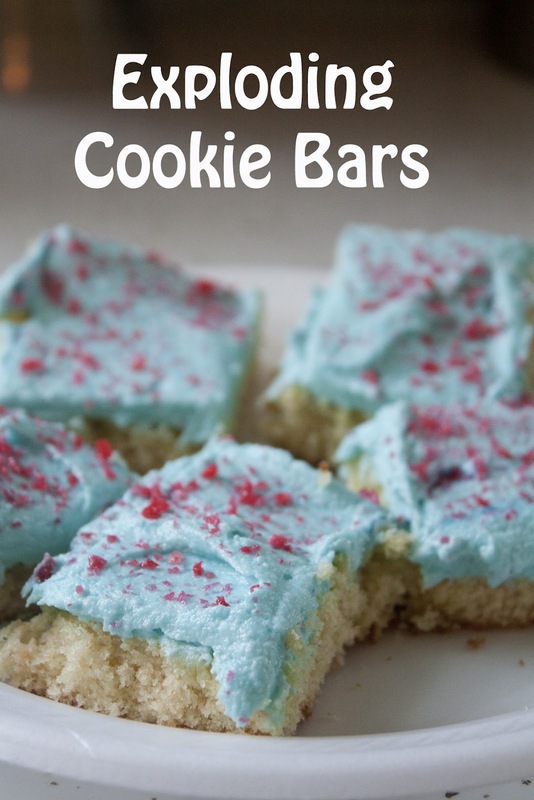 I started with a really yummy recipe for LoftHouse Sugar Cookie Bars I first found on Chef in Training. Preheat oven to 350 degrees and spray a jelly roll pan with cooking spray. Cream butter, cream cheese, and sugar. Add egg and vanilla; mix well. With mixer on low, add flour, baking soda, and baking powder until just combined. At this point you can press it in your pan and bake for about 20 minutes. Or you can add Pop Rocks and then bake it. The Pop Rocks crackles when you add them, but they do keep a little of their pop. I do think you would need more then I added (2 envelopes) to notice them in the cookie. For the icing, I used vanilla buttercream from Cookies & Cups because it is Nathan's favorite. Cream butter and shortening until smooth (about 3 minutes) with paddle attachment. Slowly add sugar, once it is all incorporated, increase your speed to medium-high and whip for 1 minute. I didn't sift the sugar, and it still tastes good. However, I think sifting it would improve the texture a little (there isn't much to improve). Add milk to your desired consistency. I only needed 1/4 C; I think due to the heat in my kitchen. We colored out icing blue and topped it with more of the secret ingredient, Pop Rocks! 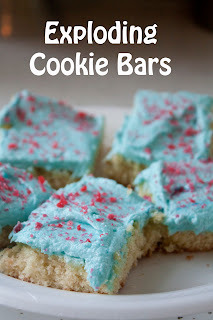 White cookie, blue icing, red Pop Rocks= patriotic exploding dessert! I used 3 envelopes, and you really notice them on top. I have a spare envelope just in case some of the pop runs out. Of course the girls liked them, but when Nathan tried them he said, "That is so cool (the popping)." Glad I made a cool dessert. I have to add, don't add the Pop Rocks on top until you are ready to serve them because they don't lose their "pop" over time. Also after you have added them, keeping them cool helps maintain the "pop" as long as possible. Enjoy!